Pretty Pink Posh August Product Release Blog Hop! Welcome to the Pretty Pink Posh August Product Release Blog Hop! You should have come from the talented Wanda Guess‘s blog. If not don’t worry I will give you a list of participants towards the end of the post. Paulina released five new iridescent sequins and three new dies on the 1st of August. And they are already selling fast. Here are the pictures of the new iridescent sequins and new dies. They are all available for purchase from Pretty Pink Posh shop. These sequins are beautiful especially in real. My eyes widens with a big smile on my face when I see these sequins, I tell ya! I love all the colours. Must have in my opinion. The dies are so versatile. Love the Twine and Bow die. You can add bows on your card without adding bulk now. The Story Book 1 die is great to create your own story scene on your card. The Stitched Speech Bubbles are perfect to add smaller sentiment to the scene. I have put together some projects using these gorgeous dies. It is going to be a long post. So make yourself a cup of coffee or tea and enjoy! Here is my first card using the Twine and Bow die. I simply die cut the die using coloured cardstocks and adhered on a white card front and added the corresponding coloured bows to it. I think this highlights the dies a lot. And to the bows I have added the iridescent sequins to its centre. The sentiment is from Birthday Messages from Simon Says Stamp which I white heat embossed on black cardstock and adhered on the card front using foam adhesives. My second card here tells a fairy tale! I used Mama Elephant die to die cut a rectangle black panel with the stitched detail then used the Story Book 1 die to die cut the inside of the panel. This is my frame. I then diecut another white cardstock with the Story Book die and I am using the positive rectangle pieces. 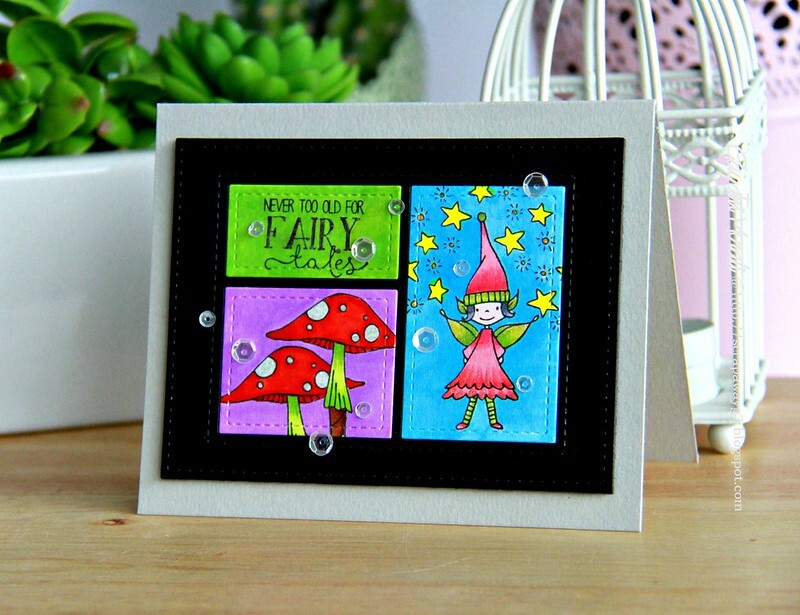 I masked and stamped the images from Under the Toadstool stamp set from Taylored Expressions. Then I copic coloured the images and also the background. I then inlaid the coloured panel in its place on the black frame with a supporting panel behind. This panel is mounted on a grey card base. Finally embellished with everyone’s favourite Sparkling Clear sequins. This is special to me. Paulina emailed me asking if I want to put together a sequin mix. Oh my! Who wouldn’t, right? I was thrilled and said yes. So here is my sequins mix called Tropical Days Sequins mix. This is limited edition. So get it fast before it disappears. You all know I am a bright girl. I love everything bold and bright. My mix has very pretty pinks, oranges, greens and even iridescent sequins which will make anybody happy 🙂 I made a shaker card using the Stitched Speech Bubble die set and my Tropical Days Sequins mix. On this card, I have used the positive and negative of the Stitched Speech Bubble die set. With the negative of the die cut I made a cover plate and used it to make a shaker card. Then I stamped the sentiment on the positive speech bubble and added the layered flowers in coordinating colours. The flowers are from Bloomers 1 die set from Taylored Expressions. Now no blog hop is without prizes. Paulina is giving away two $25 gift certificates. Winners will be picked randomly along the blog hop. Comments must be left by 11.59PM PDT on 9th of August 2015. Winners will be announced on Pretty Pink Posh Blog. Apart from Paulina’s prizes, I am celebrating the release of my sequins mix Tropical Days by giving away one lucky random winner my sequin mix and one die set of their choice. Woohoo! Winner will picked from my blog comments. Comments must be left on my blog by 11.59PM PDT on 9th of August 2015. I will announce the winner on my blog. Your next stop is to the talented and gorgeous Jeanne Jachna‘s blog. If you here first, here is the list of participants on this blog hop. Make sure you leave some love on everyone’s blog. Hope you liked my projects using the new dies and sequins. Thanks for stopping by my blog post. I absolutely love the bows card. The colours on the other card are great too. Love the cards with the bows. The colors are great and I want to get the new release. BEAUTIFUL colorful cards today! Wow! I just love the bright pops of fun color! Fabulous showcases of the new release! The bow card: brilliant. The fairy tale: a sweet 'story' told in those frames! Again, your creativity amazes and delights! love the cards you made, i need all the dies and the new sequins are so pretty! Clever designs and love the colours! Brights, clever and gorgeous!! Your cards are amazing! Love them! WOW, WOW, and WOW – gorgeous colors and ideas. Love that peacock sequin color. I just signed up to follow = thanks for the inspiration. All cards so vibrant and cheerful!! How clever to use the speech bubble die to create multiple windows!! 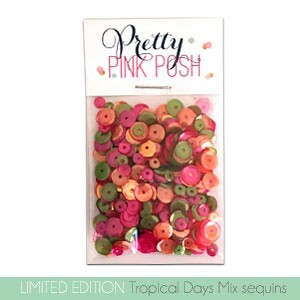 And the Tropical Days sequin mix looks wonderful!!! Congrats! Love your cards! Thank you! Wow! So pretty! and that fairy is adorable! Oh my! 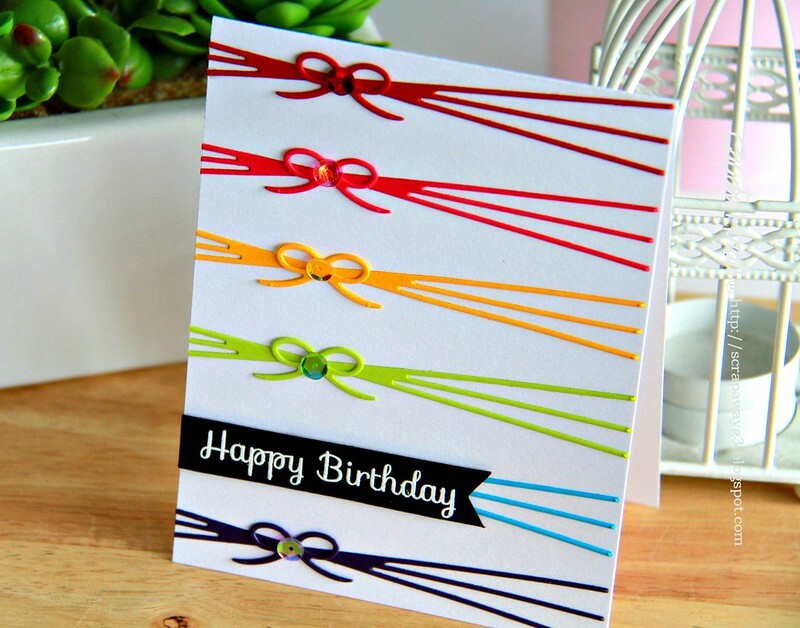 Your Birthday Bows card is simply stunning with it's simplicity and use of color! Love it!! Congrats on your Tropical sequin mix, too! It makes me think of tropical fruits. Wow Gayatri, your cards are works of art. They are so nice and bright and intricate, I just love them. All your cards are so beautiful, but your shaker card is amazing, so pretty! This is my first visit to your blog and i love your creations. They are beautiful! Thank you for the details on how you create your cards. Inspirational! I like how you made a shaker out of the talk bubbles… so cute! I love how you did the shaker! 😀 TFS!! I seriously love your cards!! Such a clever idea for the shaker! Clever use of all three dies Gayatri! You really let the die take center stage not the images! Love the rainbow bows, and OMG that shaker card with the Speech Bubbles just blew me away! I can't believe how incredibly beautiful the cards are. The one with the fairy on it is a work of art and I love the colors. You've convinced me that I need to get the dies! And the sequins are a given. Such sweet cards, thanks for the inspiration! Amazing cards!!! The new dies are to die for; absolutely! The new sequins are amazing colors! Amaze BALLS really great card. What darling cards!! I really love the balloon strings die!! Love your cards especially the bow card, that die is the cutest. LOVE all your cards, Gayatri! The bow die is fantastic and I love how you used it! These cards are so awesome. I love how you highlighted each die set and all of the sequins. Thanks for these fun ideas. I love your rain(bows)!!! I love all those bright vibrant colors. Love the mix you created as well as the simple bow and twine card!! Gayatri, I love your cards! I love how you used the bow die set and the sequins, what a lovely card! Wonderful cards! you really showed this set off, I'm especially loving the picture window die! Love how you used the Mama Elephant die with your first card, & such a fabulous idea to use the speech bubbles to create windows for a shaker card! AWESOME! So excited for the new Pretty Pink Posh release. Can't wait to get my hands on them. The Bow Die makes such a statement all on its own! Beautiful cards! Wow! Beautiful cards. Gorgeous sequins and so many possibilities with the twine and bow die!!! Oh WOW, Gayatri, these are all fabulous!! I love your cards and the bright colors. The dies are super cute especially the Twine and Bow die. Your cards are all so bright and beautiful! I particularly like the new bow die! I agree just looking at all the pretty colors of sequins puts a smile on my face. Love all your cards! I love, love that bow and twine card. Love the new release!!! You did an amazing job picking colors for your tropical mix. they do remind you of the colors the pineapples, papyaes (cant's spell today) mangos, etc. The cards are darling. Love the nursery rhyme card. Your cards are great! Love the shaker card! OMG.OMG.OMG!!! I'm drooling over your use of these new produts. You are absolutely phenomenal at design. Bet you neve make a bad card. I really love your shaker card! The sneak peek of your twine bows card was enough to make me order days ago, lol!! Love your cards…..
Beautiful cards Gayatri!! I also love the twine and now die.. And I love love love your sequins mix!! Love the colors!! Gorgeous!! Cute and colorful card designs. I like your use of sequins. Absolutely loved the Happy Birthday card. Your cards are so beautiful with such gorgeous colours! The shaker card is stunning! Your cards are just gorgeous. I love you sequin mix … this is a must have for me … love the colors … and you are so right … who wouldn't want to create their own mix!! Love the vibrant Bow tie card and the multiple speech bubble cut outs with awesome sequins, and the cute Storybook dies with your adorable fairy! I just love how these dies turn into great shaker cards. Great card. Love the bow card and ordered your sequin mix !!!!! Three amazing cards! You outdid yourself with the shaker card which is fantastic. I just love your inventiveness! Sweet cards! Wow, so many cute cards and all so original! My fav is the speech bubble shaker card. Fantastic! Ah such great use of the new dies and sequins!! Oh, my three great cards! Love the Twine and Bows and that FANTASTIC red flower shaker card! WOW!! Stunning and Beautiful cards!! Such gorgeous sequins!! I can't wait for my bow & twine die to arrive! Love the cards. Fabulous cards! I totally love the tropical mix sequins. I'll definitely be getting it as I make lots of tropical looking cards living in Florida. Fun cards–I especially like your use of the twine and bow die! Gayatri, your cards are simply STUNNING! You are a class act! Thank you so much for sharing your work. I love what you have done with this release! OMGosh! Your cards are A M A Z I N G !!!! Love the speech bubble shaker card!!! WOW!! So much inspiration!! Thanks!!! Oh my goodness Gayatri! You have such a way with COLOR…I absolutely love all your fantastic projects! Such fun new products! Love the bow die! It's so cute. Congratulations on your limited edition sequin mix. It's very bright and pretty. These cards are just so much fun! Love the bright colors and everything about them!! The bows are just too cute and I love how you used the negative space to create the shaker card!! Beautiful cards! The shaker is my favourite! Love the new dies! What a fun new release – from the bows to the speech bubbles – so fun. Love your cards. Beautiful colour combo with the bow die. Wonderful cards! I love how you've used these dies! The sequin mix is gorgeous! Lots of very pretty colors! Thanks so much for designing them! Your bright colors are awesome! Oh my – more wonderful stamps – they seem to be getting more and more exciting the more I go through the blog hop – I so want these too. Terrific cards Gayarti, love that little woodland elf!! Gorgeous cards! I love the twine die! Love your bright colors! They are all beautiful! I love what you did with the bubble talk die! Beautiful cards and love your sequin mix! My goodness! Your colors are amazing. I love your bow card, your storybook card is eye popping and the stitched speech bubble left overs is so very clever. Wonderful job. I really like the rainbow card. So fun! All the cards a lovely. Wow!!! I'm not sure which card I love more…except that I do LOVE how different the styles are! So creative! Love all your cards. The coloring is great. I couldn't choose a favorite. Awesome cards!! I especially love the Twine and Bow die card. The colors really caught my eye. Your second card using the Storybook 1 die looks amazing. The black really makes the other colors stand out…such a sweet card. And of course, I adore your shaker card. So fun!! It brought a smile to my face. Amazing cards. They are so bright, cheery and just amazing! Absolutely love them.Thank you for sharing. Wow! All 3 of your cards are simply amazing! You've been very busy and I love all the bright colours. Gorgeous bow dies! Super creative and beautiful projects! Gorgeous bright cheerful cards, love the speech bubble shaker and your sequin selection is perfect!! Stunning cards! Love those dies! Wow! The card with the bows is so creative and adorable! Wow- I'm impressed! Great cards, love the details & colors! Your sequin package is gorgeous! I love the way you used the little bows. So cute. I love the new dies, especially the way you made one of them into a shaker card. Awesome idea! Am blown away by your amazing cards!! Love your sequins Tropical sunrise mix! Love the cards!! Especially the ones where you matched cardstock bows to sequins so perfectly!! Also what a lovely sequin mix you created! Love your fresh, interesting cards with a great mix of style and balance! That bows card is striking! Great way to highlight the new dies! I also love your sequin mix and the card you made with them. I'm a bright colors gal myself and I LOVE your pretty bows against the white card base. And then the brightly colored speech bubbles against the dark cardstock…wow. But still you give us more with the shaker card using your totally awesome new sequin mix. All 3 cards are wonderful! I love all of your projects shown, but want to comment on one in particular. The negative and positive of the speech bubbles is so creative and looks wonderful. Thanks for the inspiration. Love all the cards, so cute! Thanks! Wow!!!! So very pretty! Loved them all!!! Oh Gayatri……your cards are AWESOME!!!!! The first card literally spoke to me….totally love the way you filled the card front with a rainbow of colors using the Twine & Bow die and coordinating sequins. <3 <3 <3 it! The second card is adorable with the Storybook Die 1 with bright and beautiful images. Such a happy card. The third card with your own mix of sequins and filling the front with images from the Storybook Dies is outstanding and cheery. Thanks for sharing your great talent….I “stalk” you on IG too!! Fabulous cards! Love each one! The Twine &Bows set is at the very top of my wish list! Love your cute idea with the rainbow colors! Gayatri, I love your style. 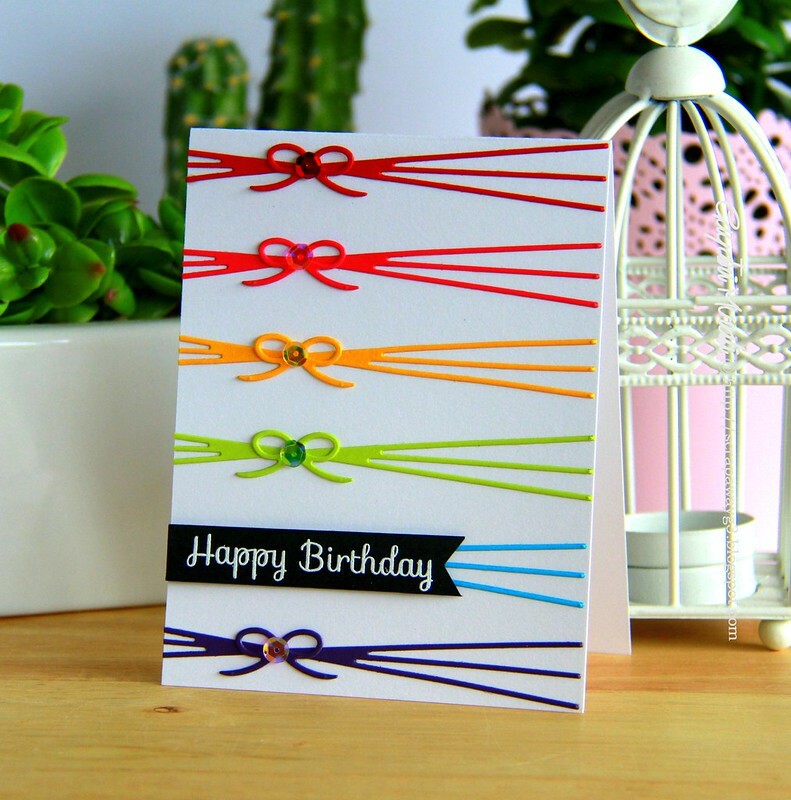 The twine and bow dies in rainbow colors made such a happy card. Thanks so much for sharing. Beautiful colors and designs, Gayatri! Love love love these new dies, especially the storybook set. Thanks for sharing these fun and happy cards! Amazing cards. I love the clean and simple white card with the colored bows. Each card is so fun, but the last card with the shaker design was just super. Thanks for sharing with us. I love all your cards, so bright and colorful!!! Love! You used these awesome dies in such a creative way! I love all your cards and your coloring always amazes me! I love what you did with the stitched speech bubble. Wonderful designs. Ahhh I love the cards!!! The bow card is so awesome! CONGRATULATIONS on your sequins mix Gayatri – LOVE IT!!! I confess that the Twine & Bow dies won my heart the second I saw them, now that I can see the design opportunities with the others, I think I NEED them ALL!!! Fabulous cards of perfection! Stunning and elegant! 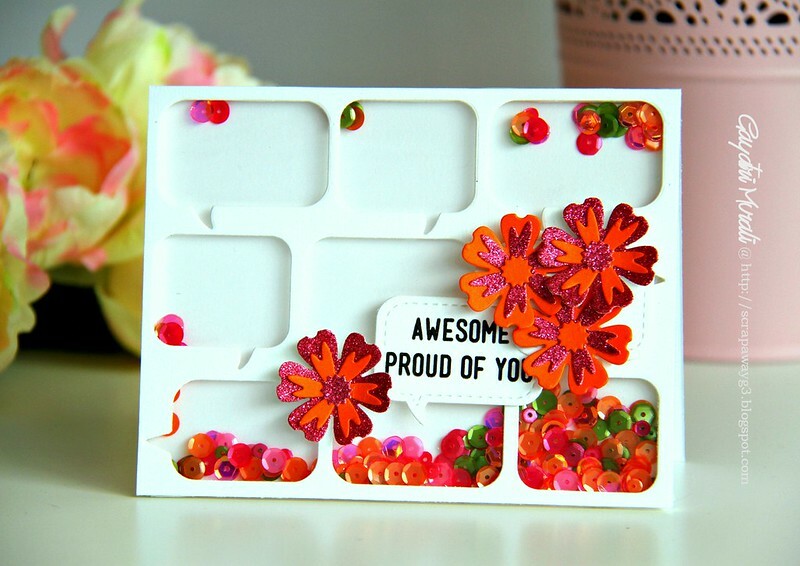 I am wanting all three of the dies and your shaker card and new sequin mix is WOWSERS! Wow! I love, love, love the bright and simple bow card! And what a cute and fun shaker! the rainbow card is super adorable!! How exciting to have your own sequin mix!!! Thats awesome and the colours are gorgeous. Just love the way you used the bow dies, they look so colourful and crisp across the card. Wow, you have been one busy crafter! Not one but three cards! I love them all but that shaker card is beyond cute! Your Tropical Days sequins are a beautiful mix! My favorite is the shaker card, love all the wonderful colors. Love the speech bubble shaker card, and the sequin colors! These new releases from Pretty Pink Posh are so fun! It is exciting to see all the new items and how they can be used to create great cards! Outstanding ways to showcase the new dies, Gayatri! Your tropical sequins packet contains such gorgeous colors. Great hop! Wow! You are so super talented! I am new to your blog. The rainbow colored bows are adorable. And your COLORING on the second card…amazing!!!! Great cards!! Wowsa!! Awesome cards! Darn, I wasn'tsure too interested in the bow die, until I saw that cute card with it! Your cards are lovely and so amazing!! And the sequin ix you have created is awesome beyond belief – what a cool color mix!! You have done some great things with PPP products and you rock!!! Wow, these are all spectacular! I am loving the storyboard die! Wow, your cards are beautiful. I love the colors you used. Thank you for sharing your talents. I just love how simple this is and yet how easy it is to complete with the bows.The shaker is so Pretty. Great Cards. Your cards are clever and colorful and beautiful, in that order. I love the twine and bows card, but that shaker card is the tops in my book! Love the design, the colors, and of course, those beautiful sequins! Wonderful work. TFS!